Enjoy another issue of NetEqualizer News! This month, we preview new features and hardware changes for NetEqualizer coming in 2013, discuss a recent NetGladiator Hacking Challenge security assessment, and announce 2013 NetEqualizer pricing. As always, feel free to pass this along to others who might be interested in NetEqualizer News. For many, January is a time of new beginnings (good luck with all your resolutions!) and preparing for the future. Here at APconnections, we are thinking about what is important to achieve in 2013, what we should resolve to do to best meet our customers’ needs, and how to continue our leadership in giving you the best solutions for achieving faster, more secure networks. As part of our planning, we have resolved to continue to stay abreast of advances in technology so that we can leverage them to give you, the customer, the best bandwidth shaping and web application security products! We’re constantly trying to keep our units up-to-date and on the forefront of bandwidth shaping technology. In support of this mission, 2013 will see the retirement of the NE2000 as a new unit. Current NE2000 customers, do not fear. We will continue to support and develop updates for NE2000 boxes just like we will for the new units. The lowest throughput license will now be 20 Mbps and the -20 and -50 units will be moved to the NE3000 platform. This will provide faster processing to users at these bandwidth levels and will ensure that our hardware is kept inline with industry advances. While it appeared the application was good to go, near the end of the assessment our security experts discovered a hole that eventually led to full compromise of the site. It turns out that the registration form did not properly block SQL characters from all entries. While the freeform text fields did block SQL characters, drop down menus like State and Country did not. Because of this one lapse in protection, the entire database schema was discoverable, which led to the database content being saved and downloaded. This then led to user password compromise of an administrator account which resulted in super user access to the administration area. Luckily, this was all part of the Hacking Challenge, so no actual harm occurred! This example goes to show how important a third-party audit is. Even when precautions are taken, all it takes is one vulnerability to completely compromise a site. Take our Hacking Challenge today! As we begin a new year, we’re making some minor changes to the NetEqualizer product line. To start, we’ll be deploying new features and faster hardware – see the other articles referenced in this newsletter for details. We’re also releasing our 2013 Price List for NetEqualizer, which will be effective February 1st, 2013. However, all Newsletter readers can get an advance peek here! The price list can be viewed here without registration for a limited time. You can also view the updated Data Sheets for each model once in the 2013 Price List. Current quotes will not be affected by the pricing updates, and will be honored for 90 days from the date the quote was originally given. We’ll soon be releasing new features for NetEqualizer. We have done some significant work in our upcoming release with respect to managing network traffic from the outside of private network segments. The bottom line is we can now accomplish sophisticated bandwidth optimizations for segments of large networks hidden behind NAT routers. One basic problem with a generic bandwidth controller is that they typically treat all users behind a NAT router as one user. Coming soon, we will shape not only on IP address, but on an IP/Port combination, so that we can optimize connections even in heavily NAT’d networks. For more information on this approach, check out this blog article. For customers that use Microsoft Active Directory in their organizations, we have added the ability to correlate IP addresses to user names. This will help administrators view the user names associated with IPs in the Active Connections table and more easily enforce and analyze bandwidth usage. We are currently looking for beta testers for this feature. If you have Active Directory and are interested in participating in the Beta, send an email to sales@apconnections.net. Remember, new releases (aka “software updates) including all the new features described above, are available for free to customers with valid NetEqualizer Software & Support (NSS). Key West’s second highest site (16 feet above sea level) is the former home of American author Ernest Hemingway. It is now a tourist attraction and museum. 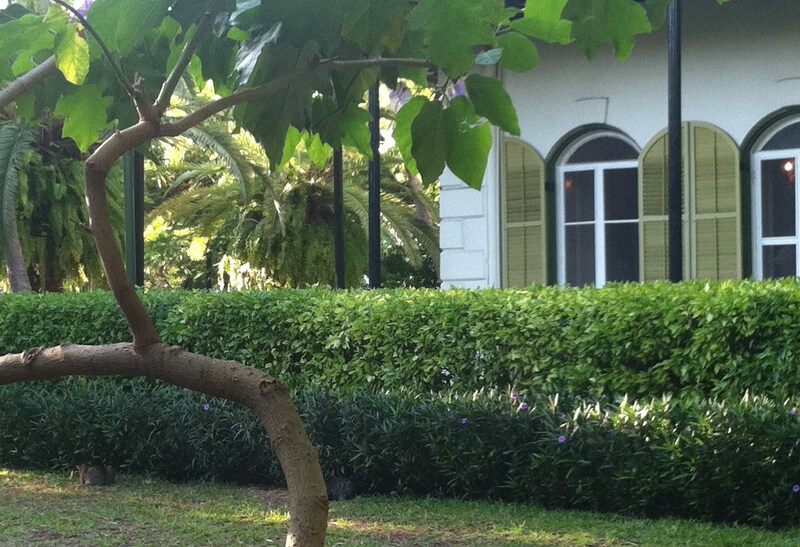 If you look closely below the bushes you can see a couple of the six and seven-toed cats that roam around the residence. The house was visited by one of our staff members on a recent jaunt to Key West in an attempt to escape the frigid weather in Colorado. « Bandwidth Control from the Public Side of a NAT Router, is it Possible?